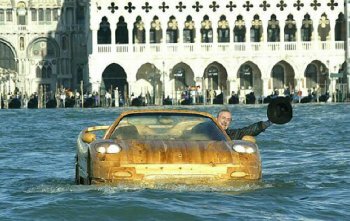 Venetian master sculpture Livio De Marchi always causes a stir amongst onlookers when he motors around the canals of Venice in his beautifully-crafted wooden Ferrari F50. 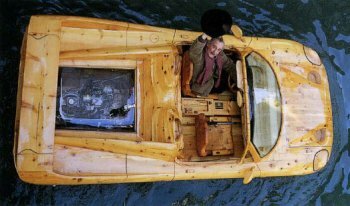 The wooden sculptures of Livio De Marchi, which also include a life-size Jaguar and Mercedes motorised 'boats', are widely recognised and appreciated in many countries across the world. There is a special appeal to his realistic wood sculptures that makes his Gallery in Venice an important place to visit, in spite of the competition from the great historic landmarks of the City. The Houses of Books are among his most famous Work. These are actual houses with Roofs, Walls and every piece of furniture inside built amazingly around the theme of Books. He built one in the Venetian country side, one in Germany and one in Japan. Livio was born in Venice where as a child, he worked on ornamental sculptures in the Venetian tradition in the workshop of a craftsman. At the same he studied art and drawing at the Accademia di Belle Arti in Venice. He showed great skills in moulding materials, transforming them with wit and panache and easily creating sculptures with grat details. During his artistic evolution he started with marble, then bronze, and eventually settled on his favorite medium, Wood. Since he opened his studio, Livio has allowed his fantasy to take wing, exteriorizing his inner World. Following a personal tragedy, he found solace in his Art and decided to continue in the venue that was making him happy, and - as it turned out - making the people around him happy too. His artwork was exhibited World Wide: Milan, Florence, London, Paris, Düsseldorf, Zürich, Tokyo, Los Angeles, San Fancisco, Chicago and now New York. It was acclaimed in several magazines such as "Interior Design", "Capital", "Casa Vogue", "Madame Figaro", "Vogue", "Hauser", "Decoration"..., and was the subject of many television features in several countries. In 1985, Livio created an enormous Origami "paper hat" in wood . In 1986 a gigantic floating woman'. In 1987 he carved in Origami style a dove of peace which stands alongside the paper hat in the Central Park in Himeji (Japan) as a monument. In the same year the Kunsthalle Museum in Emden (Germany) acquired a big pot with brushes Flowers of the Artist. At Kimihiro Fujii's Gallery Hiro in Tokyo there was a personal show. In 1988 he realized a floating lifesize 1937 Jaguar, sculptured in wood. The Carsch House in Düsseldorf (Germany) organized a personal show for Livioi. In 1989 he carved the lifesize Fiat Topolino model. A. The Jelmoli company in Zürich organized a solo show. In 1990, he created the House of Books. It is in S. Anna - Tambre D'Alpago, Italy. It has already achieved worldwide fame. In 1991 the Jelmoli company organized another show for him in Zürich. 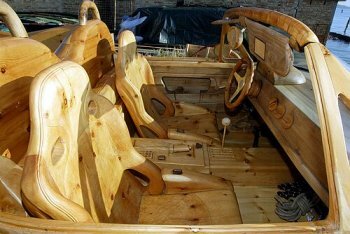 The wooden sculptures of Livio De Marchi, which also include a life-size Jaguar and Mercedes motorised 'boats' as well as the Ferrari F50, are widely recognised and appreciated in countries across the Globe. 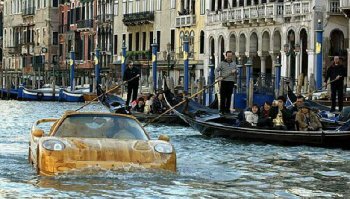 Venetian master sculpture Livio De Marchi always causes a stir amongst onlookers when he motors around the famous canals of Venice in his beautifully-crafted wooden Ferrari F50 'boat'. In 1993 Dutch Television (Tros) made a special documentary about him. Ripley's American Museum in S. Augustine - Florida purchased the "Fiat Topolino" and the floating "1937 Jaguar". The museum of art in Muskegon - Michigan (U.S.A.) purchased a big pot of brushes to put on display in the museum. Livio De Marchi carried out the "House of Books n. 2" in Germany - Bergneustadt (between Frankfurt and Köln) for a private collection. In 1994 he realized a floating work of art with the title "a dream in Venice": a huge pumpkin drawn by 4 horses, which rear up when the driver pulls the reins. The pumpkin can accomodate 4 people. It was one of the jewels of Carnival 1994. After a few months the museum "Ripley's Believe it or not!" obtained this piece, too for its collection. In October 1994, he constructed his "House of Books n. 3" in Japan. It is at the Pension Costa del Sol on the peninsula of Izu, in front of the Pacific Ocean. Livio intends to execute 10 of his "House of Books" creations around the world. For Carnival 1995 he carved an 8 metre high vase with 12 flowers (4 roses, 4 tulips, 4 daisies). It was anchored near the Dogana on the Grand Canal. In Spring 1995 Angelika Obermüller organized a personal show in Munich in her Gallerie + Tee. In June 1995 he showed his artworks in a personal exhibition in Austria in a wonderful old castle in Frohnleiten. From March 30th to May 4th 1996 there was a Personal exhibition at the Galerie Lieve Hemel in Amsterdam. In February 1997 he created a floating wooden motor car "Mercedes Seagull",and it was shown at the Art fair KunstRAI and there was another personal exhibition at the Galerie Lieve Hemel in May-July. 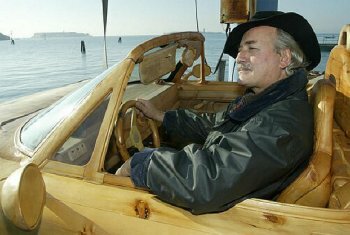 In Febuary 1999 he created a floating wooden car “Volkswagen Beetle”, and it was shown at the Art fair Kunst RAI in June 1999 and in June-July 1999 a personal exhibition was shown at the Galerie Lieve Hemel. In 1999 - 2001 his works were shown at SOFA Chicago c/o Mostly Glass Gallery. In 2000 the exhibition Il Legno in Vetro was shown at the gallery Pauly, S. Marco square in Venice. 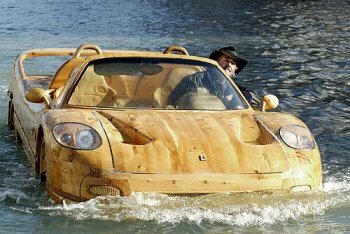 In 2000 he created a floating wooden Ferrari F50. In 2001 the Ferrari and other Unique Sculptures were shown at the Palm Springs International Art Fair in California. This was the start of USA Tour coordinated by Mostly Glass Gallery, Englewood NJ.